Blue Goose Rugby player Scott Snook (front) leads teammates Kevin Gerbes (blue shirt) and Alex Rhodes (gray shirt) through drills at Carter Park in May. The team, known officially as Gentlemen of the Blue Goose, is open to adult rugby players of any skill level and travels the region for games against other mountain town teams. 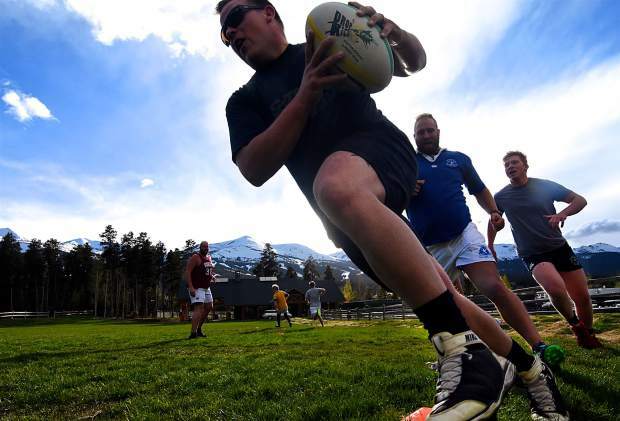 The rugby season is nearly here and the Gentlemen of the Blue Goose — the official name for Summit County’s adult rugby club — is in need of a few good men. Stop by practice on Mondays and Wednesdays from 6-7:30 p.m. to meet the guys, learn some skills, break some tackles and cap it all off with a beer or two. A taste test is free and open to anyone, ages 16 years and older. No playing experience required. If you want to join, club dues are minimal (around $20). They buy you socks and pants in the club’s signature blue, plus player’s insurance for the games. Call club president Kevin Gerbes at 970-333-1696 with questions. The Gentlemen of the Blue Goose take very few things seriously. The club is one of them. Beer is another. On a chilly May afternoon, a small group of veteran and untested players with the storied Breckenridge adult rugby club were practicing at Carter Park. The start of the season was still a few weeks away at that point, but there was plenty of work to be done, like bringing rugby newcomer Mike Williams up to speed. Williams, a new addition to Lake Dillon Fire District had never been on a rugby pitch before joining up with the Gentlemen (or simply Goose, as the guys are more likely to say). He’d seen the game in college and liked what he saw, but he never had a chance to get his jersey dirty in a scrum, or even run formations with other rugby players. That all changed when Williams stopped by his first Goose practice earlier this spring. There he met Scott Snook, club treasurer, and Kevin Gerbes, club president. He also met with guys like Dan Chapman, who was born in Australia and moved to Summit County at 10 years old, and Alex Rhodes, another transplant from overseas who now lives in Breckenridge. Across the United States, rugby is hardly as popular with kids or adults as football, soccer and basketball, but in Summit County and neighboring mountain towns — where international residents tend to congregate — it’s always had a strong presence. Take the Goose for example: The club has been around since at least the ’80s, and probably earlier, Gerbes said. Team photos from 30 or 40 years ago line the walls at Fatty’s Pizzeria, and when the club plays at home, the games tend to draw at least one or two club alumni. Gerbes story is pretty typical for the Goose. He was recruited to play football by Iona College in New York, but when he couldn’t stand the coach and the program, he met a few guys with the school’s club rugby program. One game later, he was hooked. Truth is, with the exception of a few international players every season, hardly anyone on the team played rugby until they were adults, and a good number didn’t play at all until joining the team. Others, like Chapman, came to fall in love with the sport because of the brotherhood — literally. Talk to enough rugby players — new and seasoned, young and old — and they’ll talk about the camaraderie of the sport. Between beers, someone at Northside mentioned an old rugby adage: “Rugby players are gentlemen playing a hooligan sport, and soccer players are hooligans playing a gentleman’s sport.” Rugby might look fast and hectic and brutal, Chapman said, but with time and proper training it’s an intricate battle between families. “The whole family thing is thrown around a lot with sports teams, but it really does happen with rugby,” said Karl Barth, head coach for the Summit Tigers girls club rugby team. And Barth would know: Since helping a duo of students launch the high school-level club in 1997, the girls team has won a slew of state championships, including nine consecutive titles, and has sent dozens of players to NCAA programs across the nation. But how? How did a small mountain community of fewer than 30,000 full-time residents become such a hotbed for rugby, especially girls rugby? Barth doesn’t have the answer, but he has three good guesses. The first is obvious: girls don’t have other options for contact sports, save hockey, and that always draws a small number of the 50 or more who try out every season. The second and third are just as obvious, but hard to pin down. A high school-level boys club hasn’t been so lucky. That team has been through three iterations over the years, including a short-lived team from 1997-98, and another brief stretch in the early 2000s. Those programs still managed to produce three national-level players, but between practice facilities (there weren’t any) and coaches (they didn’t stay long), the teams didn’t have staying power. But maybe the third time is the charm. The latest boys club, the Summit Renegades, was founded last season by a small group of students and a former Goose coach, Peter Clarke. They went winless that first year and then made the postseason this year, drawing just enough players to field a 15-man team. Life seems simple now, but Barth remembers how difficult it was to field a girls team in the early years. Dozens of elements must come together for a club to flourish, and he’s confident the Renegades have what it takes to survive. This season, the Goose club is in a similar position. The team doesn’t have enough guys committed to field a full 15s team, and the start of the season is just two short weekends away. But Gerbes and crew will still be on the pitch at Carter Park, rain or shine, playing a sport they’ve come to love.